People have trouble remembering important dates. One of these important dates is a wedding anniversary. So some folks try to pick a wedding day on a special, easy-to-remember day. Check the number of weddings that were on July 7, 2007. Easy to remember (07-07-07) so new wives married on that day could count on their husbands remembering their anniversary and delivering on the yearly obligatory flower order and jewelry. On top of that seven is considered a lucky number so a successful, long lasting marriage is sure to be the result. And the jewelry is only insurance. But how ’bout someone who gets married on Friday the thirteenth? 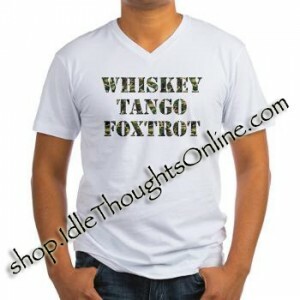 Whiskey Tango Foxtrot is that all about? My normally sensible stepson did just that a couple of years ago. Not only did the marriage last about as long as a midwestern tornado with almost as much financial damage, but his sister’s fiancé died less than a month after the ceremony. Really bad luck all around. But it did present an unusual opportunity to compare a wedding and a funeral in quick succession. These two life altering events hold lots of similarities with each other. First there are the side gatherings of wedding showers or wakes where people talk about the persons involved and donations are made to the cause which is probably a little better tradition than burying a pharaoh’s household slaves with him. In both cases people get dressed up, then they gather around and cry like schoolgirls at the end of term. The main ceremony is usually but not always in a church, officiated by a cleric of some sort. And afterwards it’s all about the food. Cake and catered, undersized, mystery entrees symbolizing the couple’s new life together for the wedding, and stale mystery meat sandwiches served in a church basement, I guess symbolizing death, after the funeral. Thirty odd years ago, every month or so seemed to have a friend’s wedding scheduled. In addition, several were mine which I always showed up for, for better or worse. Now I’ve reached a time of life that I notice I’m attending more and more funerals. The last funeral I attended was a family member’s scheduled at the same time as a funeral of a work associate from long ago. In an effort to keep harmony with the people I see every day, I opted for the one for the family member. But when it’s time for mine I’ve decided I’m not going to it. I’ll be busy with other things. That’ll show ’em.